Curated by Jason Patrick Voegele of Republic Worldwide, Samson Contompasis of The Marketplace Gallery, Keith Schweitzer of M.A.N.Y. and Tyler Wriston of The B.A.C. Much of what we know and how we learn comes through the study of explicit or subtle comparisons and contrasts. Meaningful opportunities for these comparative studies invite us into a more explicit and intentional approach that can both broaden our understanding of contemporary American art and help us draw connections and distinctions between the studio practices and conceptual intentions of today’s American Artist. Produced and developed by four of New York State’s premiere curatorial teams, Town & Country presents just such an opportunity. Much like the rest of the western world, our press, politics, and creative arts thrive on the institutions we have erected to illuminate our differences. We are often reduced to the divisive labels of righteous and heretical, pious and secular, liberal and conservative, formal and conceptual, urban and rural. Dressed up in the costume of duality it appears that we are a bisected people from the fundamentals to our personal tastes. This exhibition challenges those preconceived notions and offers a unique window into the collaborative state of American art. As a people, our founding fathers had faith in the principals of open dialogue, freedom of expression and the multiplicity of our intellectual and creative capacity to bind various philosophies into one singular union. As an exhibition, Town & Country celebrates these great strengths and offers up a chance to draw attention to the ties that bind us as a great creative culture wherever we are from. Through this lens, Town & Country proposes a new vision of American art reinterpreted for a new generation. On June 28th through June 30th at 320 West 37th Street in New York City, Republic Worldwide, The Marketplace Gallery, Keith Schweitzer (M.A.N.Y. 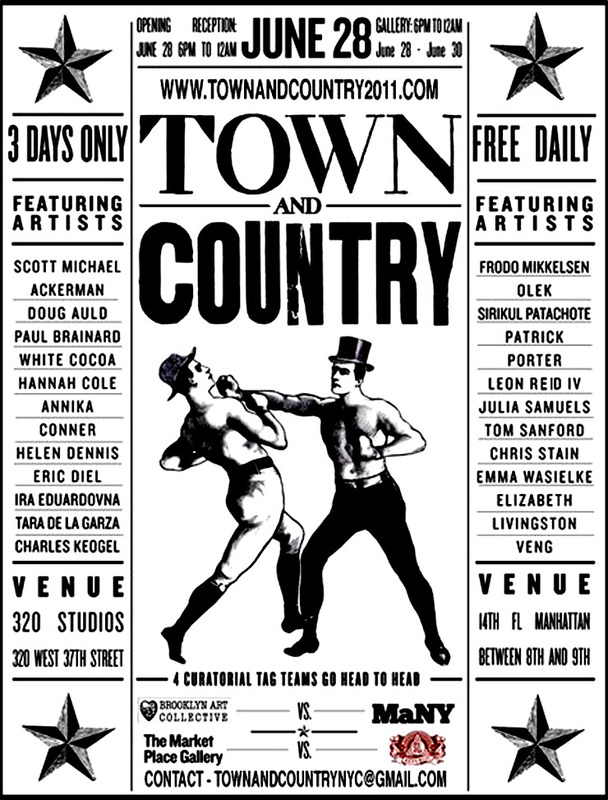 ), and The Brooklyn Art Collective invite you to join the discussion and stoke the fires of debate as we present Town & Country: the very best of contemporary American art. Artists include: Scott Michael Ackerman, Doug Auld, Paul Brainard, White Cocoa, Hannah Cole, Annika Conner, Helen Dennis, Eric Diehl, Ira Eduardovna, Tara de la Garza, Charles Koegel, Elizabeth Livingston, Frodo Mikkelsen, OLEK, Sirikul Pattachote, Patrick Porter, Leon Reid IV, Julia Samuels, Tom Sanford, Chris Stain, Veng, Emma Wasielke, and Fedele Spadafora.